Toyota Should Be Worried - Cars! Cars! Cars! AutoWeek reports: Slipping Sequoia. What kind of sick company tries to have it both ways? Yes, Toyota's Prius is great (and a handy hatch as a commenter pointed out) and we dig the Camry Hybrid. 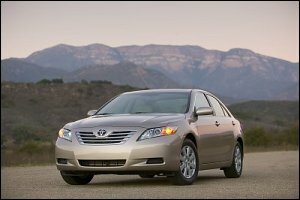 The Camry Hybrid is a smart move and far better choice than the Accord hybrid (don't buy the Accord hybrid). But, Toyota's not so hidden secret is that it makes a lot of big vehicles. Big. Stand next to an '06 Sequoia. It's huge! Now get ready for the next one. 'Cause it's bigger, baby! "I worry about the Sequoia being too big and not having enough fuel economy, more than I do with the (redesigned) Tundra," said Don Esmond, senior vice president of automotive operations at Toyota Motor Sales U.S.A. Inc. In unrelated news, Mr. Esmond has been attacked by upwards of 45 ninjas and has yet to be seen since that quote. And the ninja thing. Hey, Toyota, cut it out with the silly-big shite and get back down to Earth. Heh, ninjas. That's a snap of 2007 Camry Hybrid. With some mountains. Man, Toyota's gotta work on its press site... the photo section is really awful. Anyway, want a bordering-on-large family car that gets good gas mileage? Look no further. And don't look at the Accord Hybrid... what a mistake Honda made. Fix it already, Honda!